Are you looking to stay put and improve instead of move? Or maybe you would like to make your home more appealing to potential buyers? Whichever end of the scale you’re at, one thing that’s certain is that damp and mould is one of the biggest turn-offs for both homeowners and would-be buyers alike. Due to its positioning, your roof is the most likely area of your home to be affected by moisture, damp and mould. So, it stands to reason that if you take good care of your roof, the rest of your home will be protected against the elements for many years to come. This can be done by upgrading a rotten roofline with high-quality, low-maintenance PVC roofline products. 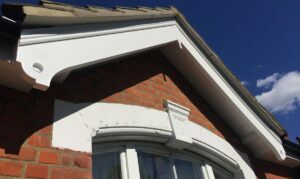 PVC roofline products are incredibly durable and long-lasting, as they will never warp, crack, rot, flake or fade; unlike their timber counterparts. Roofline describes the frontage immediately below the roof and eaves, which protects the rafters and allows the building to breathe. Consisting of fascia, soffits, bargeboards and guttering, these should be checked regularly to make sure they’re still watertight and preventing serious damage to the roof and the rest of the property. Visible cracks in the walls can range from surface blemishes due to settling issues or larger problems such as water damage. Once they’ve been thoroughly checked out and addressed, if you have unsightly cracks on the outside of your home you may wish to consider renovating the exterior with high-quality fibre cement cladding. Available in a wide range of colours and textures, including on-trend neutrals and greys, you’re guaranteed a durable and long-lasting finish that will increase the enjoyment you get from you home as well as enticing potential buyers. PVC cladding expertly enhances the insulating qualities of your home, making it considerably warmer which helps to reduce carbon footprints and energy bills in the long-run. Via its thermal boosting qualities, PVC cladding can also limit the effect of exterior noise. So, if your home is located near the main road it may be worth considering renovating the exterior with high-quality uPVC cladding. Even if you don’t have any of the aforementioned issues, the majority of house hunters are unable to look past the aesthetics of a property. So, if it’s looking run-down or dilapidated this is going to seriously affect your chances of a quick sale. Simply apply new fascia, soffits, bargeboards, guttering, PVC Cladding or Fibre Cement HardiePlank® Cladding and begin reaping the benefits immediately. If you need to discuss your roofline options further, don’t hesitate to get in contact with the Fascia Solutions team. HardiePlank® vs Stucco – which is the best choice for cladding a home? 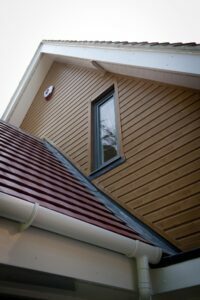 Fascia Solutions are a specialist installer of roofline, cladding & rainwater systems, based in Maidstone, Kent. Since our establishment in the year 2000, we’ve built up an enviable reputation for quality products and exceptional service. 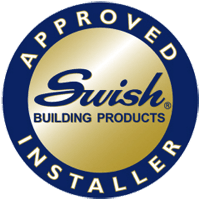 A Swish Approved Installer, we’re able to offer a range of extensive guarantees across our range of high-quality uPVC products. 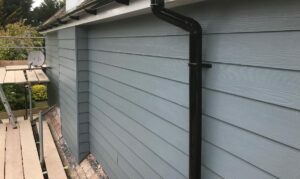 Featured in this range is cladding, fascias, soffits, bargeboards & gutters, however, we also install fibre cement cladding, which comes with its own respective guarantee.